We are passionate about supporting the communities we work in, and set aside a budget each year to help fulfil this. As well as financial contributions, we also provide staff time, allowing our operatives to take part in projects that matter to them. We’re a commercial business with a social heart. The profits we make are re-invested to fund the development of new homes and community initiatives, and ultimately to improve people's lives. 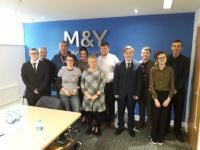 Students from Mill Green School visited our offices to see some of the work we do at M&Y Maintenance and Construction. M&Y have donated £200 worth of winter essentials to homelessness charity, Petrus Community. Find out more about how we invested nearly £50,000 into corporate responsibility projects last year. M&Y Maintenance and Construction came to rescue of a Lancashire animal sanctuary after its boiler broke. M&Y Maintenance and Construction has completely refurbished a homelessness centre in Rochdale.